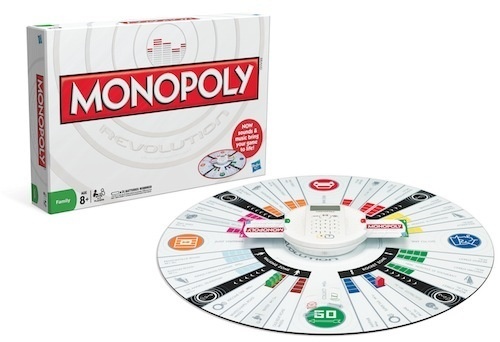 According to Gizmodo, the 75th anniversary edition of Monopoly not only features a round board (I’m sorry, “wedges” belong in Trivial Pursuit, not Monopoly), but it also features digital currency! Apparently, the gizmo in the middle keeps track of how much money you have, handles payments, gives you $200 for passing Go, etc.. Monopoly without Monopoly money? Are you freakin’ kidding me? And while I’m at it, GET OFF MY LAWN!! Curmudgeon. Old curmudgeon, even. At least now your sister can’t try to cheat when she’s banker. Of course, you also don’t get all that mental addition/subtraction practice . . . .
Wow. That’s just wrong on so many levels. The center thingy probably rolls the dice for you as well, and prevents payouts on the “Free Parking” space. Of course, I don’t even like Monopoly, so I can’t get worked up about this. I’m not one for games — in fact, I’m not sure I’ve ever even played Monopoly — but I am a proud curmudgeon, and in my official capacity as such, I agree this “update” is just plain wrong. You don’t mess around with classic things. You just don’t. Mike: $20 says that the Free Parking option is available. According to a Monopoly history I owned (yes, I was a Monopoly geek; was playing in tournaments when I was 8), more people play with the Free Parking jackpot than without.